Budget smartphone. Satisfaction level 100. I don&apos;t see any fault in this device. A good budget phone with a stock android like experience. The camera is decent enough given the price range. Rarely heats up while using. A little heat up during charging is normal. * Decent Camera in this price range. A budget phone coming for people who want to get into the Android market but do not have much of a budget houses affordable features for the price range. 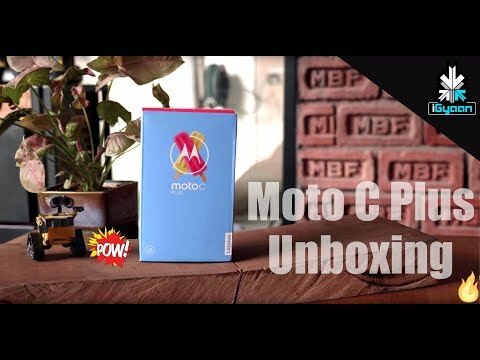 Moto C Plus does not look or feel very premium. The smartphone is constructed out of plastic and is quite chunky and heavy. Optimised software is almost as important to a smartphone&apos;s performance as the processor.The problem is that stock Android does not seem to be enough .The front camera also comes with an LED flash which is a rare feature in this price range . An affordable phone that provides the right features for the right price. The Android OS on the phone is up to date. The battery life is also huge. Camera quality is not good but looking at the price it should not be a complaint. 14 Pricebaba users have written their experience with Motorola Moto C Plus. If you own Motorola Moto C Plus, please do leave your feedback too. Lowest price of Motorola Moto C Plus price in India starts at Rs. 6,900 Motorola Moto C Plus is available on Flipkart at Rs. 6,900 and on Amazon at Rs. 7,999. Prices updated on 26th April 2019. Motorola has launched many phones under the C-series and one of the most popular among them is the Moto C Plus. It is a low-budget smartphone and packs in all the necessary features and specifications. Design-wise, the Moto C Plus looks quite similar to all the other Moto phones. It comes in three different colour options: Fine Gold, Pearl White and Starry Black. In terms of display, the phone fits a 5-inch HD panel with a resolution of 1280 x 720 pixels. This brings the pixel density to 294PPI which is quite average. The Moto C Plus flaunts an 8-megapixel camera on the rear which comes with features like HD video recording, autofocus and much more. For selfies and video calling, the phone has a 2-megapixel front camera. Accompanying both the cameras is an LED flash to ensure that low-light photography isn't hampered. Performance-wise, the phone houses a quad-core MediaTek MT6737 processor clocked at 1.1GHz. It also comes with 2GB of RAM to carry out multi-tasking. The phone runs on stock Android Nougat which ensures there is no bloatware in the operating system. It gets 16GB of internal storage which can be expanded up to 32GB via a microSD. The Moto C Plus packs in a huge 4000mAh removable battery which will definitely last more than a day of average use. Connectivity options in the phone include Wi-Fi, Bluetooth, GPS/A-GPS, 3.5mm audio jack, and a micro-USB port. 1. What type of charging connector do I need? Ans: This phone uses a Micro USB port for data syncing and charging. 2. Is its battery removable? Ans: No, its battery is not removable. 3. Will this get further software updates of Android? Ans: Yes, the phone is likely to be updated to Android Oreo in the coming months. 4. How is the camera for selfies? Ans: It has a 2MP selfie camera, so you shouldn't expect great selfie images.